You've got to love a place that has so many movie theaters to choose from. From the intimately small theaters with plush leather love seats at The Landmark, to the old-school, super uncomfortable yet awesome folding seats of The New Beverly. 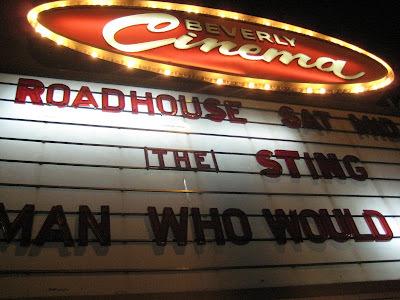 And, in L.A. you don't just have the newest Oscar noms, or mindless blockbusters to choose from but also old classics. And, sometimes these old classics aren't so old or so classicy. You can find such gems as The Neverending Story, Caddyshack or Fight Club. Maybe not "classics" in the strictest sense of the words, but movies that you grew up with that you would otherwise never get a chance to see on the big screen. Or maybe just movies you missed the first time around and fell in love with on DVD. We highly recommend checking out some of these cooler, lesser-known theaters for a showing of one of your personal classics. There is really nothing like seeing a movie you love on a big screen surrounded by a crowd of people that love it too.